Here is a recap of the past week's action in Fall and Winter leagues. For the full list of Red Sox prospects participating in these leagues, check out our Fall & Winter Leagues page, which will be updated continuously through the offseason. This week's roundup covers the period of November 21 - 27. The highlight of the week was the performance of Aneury Tavarez, who went 7 for 14 with a home run, stolen base, and a walk. The home run was his first for Oriente, and the strong week raised his line to .325/.366/.403. 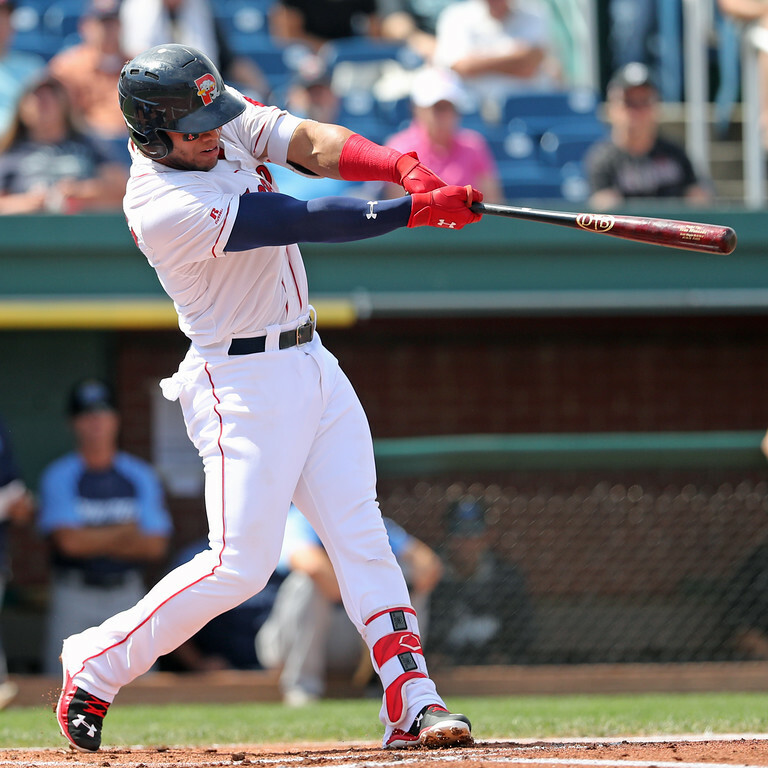 Marco Hernandez picked up his first extra-base hit this week, a double that was part of a 2 for 5 game, but he followed that up with three games where he combined to go 1 for 13 as his batting average dipped to .262. Rafael Devers got a hit in his only at-bat, and Roenis Elias allowed two runs on five hits over 4 2/3 innings in his only appearance of the week. Here is a recap of the past week's action in Fall and Winter leagues. For the full list of Red Sox prospects participating in these leagues, check out our Fall & Winter Leagues page, which will be updated continuously through the offseason. This week's roundup covers the period of November 14- November 21. The league wrapped up play this week, with the Surprise Saguaros losing 6-1 in the championship game to the Mesa Solar Sox. Michael Kopech made one start this week, going five innings and allowing two runs while fanning six and walking one. He finished his stint in the fall league with a 2.01 ERA with 26 strikeouts and eight walks in 22 1/3 innings. Mauricio Dubon had a quiet final week of the season, playing in just two games and going 0 for 7. Danny Mars was 2 for 3 at the plate in his only start and was caught stealing in a pinch running performance. On the mound, Trey Ball made one relief appearance tossed two shutout frames with a strikeout. Southpaw Jalen Beeks allowed a run in one inning while right-hander Jamie Callahan threw two scoreless innings to close out a dominant run in Arizona, featuring a 0.75 ERA in 12 innings pitched. Here is a recap of the past week's action in Fall and Winter leagues. For the full list of Red Sox prospects participating in these leagues, check out our Fall & Winter Leagues page, which will be updated continuously through the offseason. This week's roundup covers the period of November 7- November 13. Michael Kopech really struggled with his control coming off a dominant performance in the AFL Fall Star Game. He walked six in just 3 1/3 innings but was still able to put up a zero in the run column. He struck out two. He now has a 1.56 ERA in 17 1/3 innings this fall with 20 strikeouts and seven walks. Danny Mars played just two games this past week but stayed hot by going 4 for 7 with two doubles and three RBI. He is 8 for his last 14 after a 1-for-22 start. Mauricio Dubon struggled with just one hit, a double, in 11 at-bats. He also drew a pair of walks and struck out four times. He played two games at short and one in center field. Trey Ball made two appearances totaling three innings and allowed one run on three hits, a walk, and two strikeouts. Jalen Beeks also had two appearances and three total innings but did not fare as well. He surrendered five earned runs on five hits with two walks and three punch outs. Jamie Callahan gave up a run in two innings of work with a walk and two strikeouts. Chris, Ian, Matt, and the returning Mike Andrews marked the end of the season by breaking down the debates that led to our end-of-season rankings! Topics discussed included ranking Yoan Moncada over Andrew Benintendi at number 1 and Jason Groome over Michael Kopech as the system’s top pitching prospect, how the system looks compared to past seasons, and highlights all the way down each of the guys’ top 60 rankings. 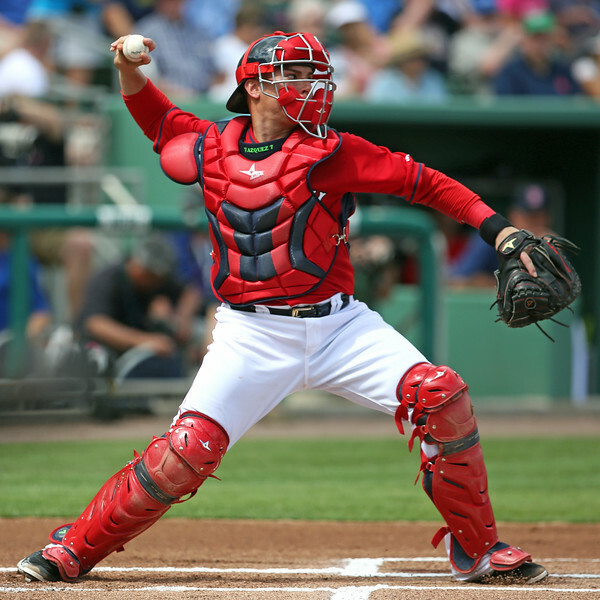 Here is a recap of the past week's action in Fall and Winter leagues. For the full list of Red Sox prospects participating in these leagues, check out our Fall & Winter Leagues page, which will be updated continuously through the offseason. This week's roundup covers the period of October 31 - November 6. The highlight of the week was Michael Kopech's (pictured) dominance in the AFL Fall Stars game, as the right-hander struck out three over two hitless innings. His fastball touched 101 mph, while he also showcased an upper-80s slider and low-90s changeup. 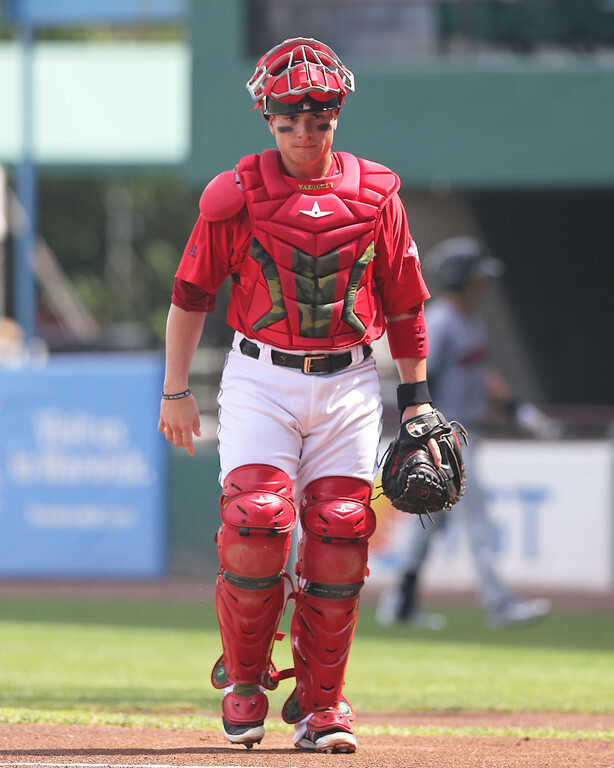 Trey Ball also made an appearance in the game, retiring the only batter he faced, and Mauricio Dubon, who had won a fan vote for a spot in the contest, reached base in his lone plate appearance on a catcher's interference. That was not Kopech's only dominant outing of the week, as he struck out six over four scoreless innings in his start on Tuesday. He allowed only one hit and did not walk a batter. Ball allowed two runs over 1 2/3 innings in his two appearances, walking three without notching a strikeout. Jamie Callahan threw two scoreless innings and picked up a save, while Jalen Beeks struck out two over two scoreless innings. Much of the prospect news this month was centered on the Arizona Fall League. 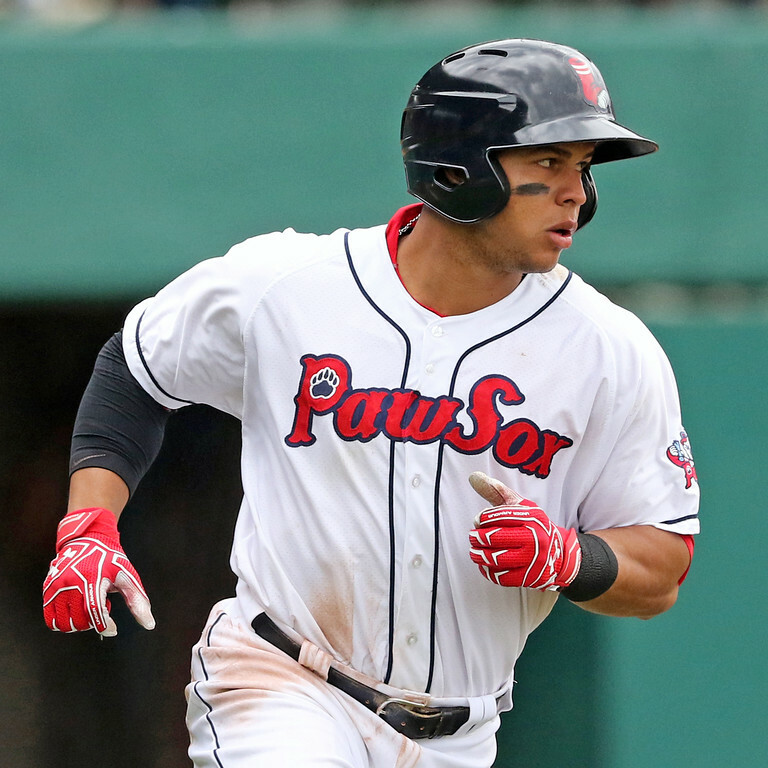 Yoan Moncada (pictured, right) was obviously the biggest name of the Red Sox. He started off on fire going 6-for-14 with a double, home run, two RBI and five runs scored over the first 10 days of the league. After that, he got only one hit over his next 10 at-bats. Strikeouts were a problem throughout his time in the AFL, striking out in 42% of his at-bats. The fall league continues through the 19th of November, but it will continue without Moncada. He injured his thumb which required a trip to a specialist according to Bernie Pleskoff of FanRag Sports. In the days since Moncada has been seen with his thumb wrapped with a splint and his time in the AFL is over. However, multiple reports have cited the fact that the injury is just a sprain and he should be ready for spring training. 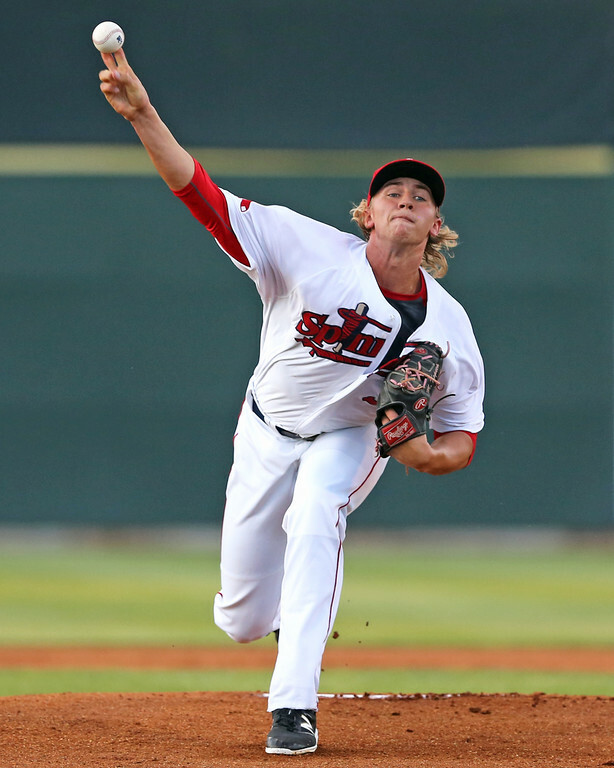 The other top Red Sox prospect garnering a lot of attention in the AFL is righty Michael Kopech, currently the ranked fifth on the SoxProspects.com rankings. He was a logical candidate to be sent to the AFL with his advanced stuff, but also due to the fact that he was suspended 50 games to start this season and needed to make up the innings. Kopech's strong Arizona Fall League performance has earned him a spot on the 2016 Fall Stars roster. Over his first three starts, Kopech has impressed, throwing 10 innings with a 2.70 ERA, 1.10 WHIP, and 12 strikeouts to one walk. He is coming off a 2016 regular season where he dominated to the tune of a 2.08 ERA, 1.10 WHIP and 86 strikeouts to 33 walks over 56 1/3 innings. It is no surprise he continues to receive national attention. Both Pleskoff and ESPN's Keith Law had very positive write-ups on Kopech's recent starts. Like everyone, Law was impressed by the upper-90s velocity and said he had "top-of-the-rotation" potential, but also stated that he needed to work on his command and his inconsistent secondaries. Pleskoff, a former Astros and Mariners scout, was much more glowing in his report, ultimately giving him a 60-grade ("all-star quality") grade.